Come and join our professional coaching staff to get a "jump start" on your 2018 - 2019 ski season during the Yellowstone Ski Festival, November 20-24, 2018. The staff provides a solid understanding of technique, and gives you tools and drills to gain efficiency and strength at the camp and throughout your ski season. The coaching staff is composed of an elite group of XC ski professionals which includes retired world class skiers, coaches and professional instructors. Coaches will rotate through groups every ½ day session so you will get exposure to different coaches throughout your clinic. The coaches think snow and skiing just about year round, and are ready to give you just the tips and techniques you need to launch your season with the best focus for you. This is no stand-around-and-learn kind of deal either. The coaches know that the best way ingrain effective movement is through practice. Plan on logging some k's. You'll also get feedback, in the dose that's right for you. While some just need a new focus and mileage, others benefit from a more consistent stream of information about whether and how much they're performing the task to the desired degree. The coaches know how to pace the flow of information, and offer up a great balance of new information, drills, and practice. There are also races, including a novice biathlon with a novice biathlon clinic, plus junior, masters, and FIS/NRL cross country ski races. Enjoy your First Tracks in West Yellowstone. Whether First Tracks truly means the corduroy and you, or it is the first time on skis this season, or the first time on skis period; you are invited to take them at the Yellowstone Ski Festival. Think Snow and make plans now to attend the 2018 Yellowstone Ski Festival. 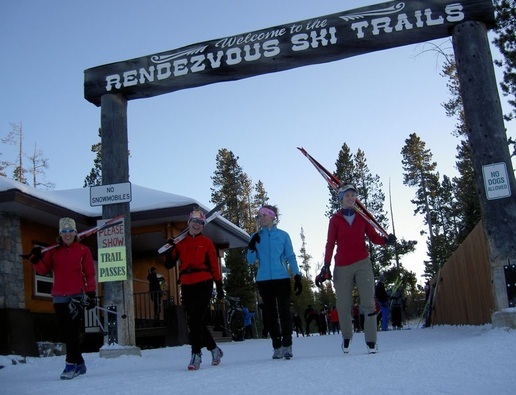 For more information, visit http://www.skirunbikemt.com/yellowstone-ski-festival and follow westyellxcski on Twitter, or friend RendezvousSkiTrails on Facebook for up-to-minute news.